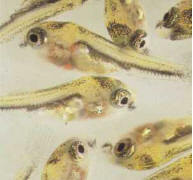 Most fish kept by aquarists are oviparous (egg-layers), but there are some exceptions - viviparous fish (or livebearers). A varied and rich diet enables fish to accumulate reserves of proteins and lipids, which help them form eggs and spermatozoa. This is the maturing phase. When the female's ovary swells, she is ready to lay eggs. This only needs a stimulus to trigger it off, such as, in the natural setting, rain, sunlight, or moonlight (research is presently in progress on the influence of the moon on reproduction). 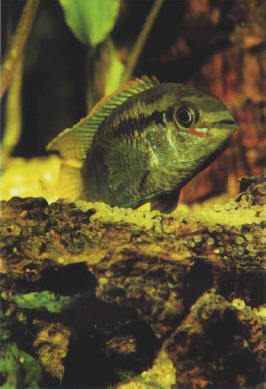 In an aquarium, egg-laying is sometimes sparked off by the early morning sunlight, which beats down on the tank with varying degrees of intensity, or by a partial change of water. The laying of eggs can be preceded by a courting ritual, during which the male seduces the female or, in rare cases, bullies her and violently sees off any rivals. The female then expels her eggs into the water, and these are immediately fertilized by the male. 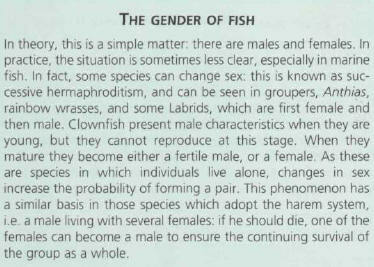 This is obviously only a general description that leaves room for the huge diversity found in aquarium fish, particularly as regards the future fate of the eggs: they can be abandoned, or even sometimes eaten, by their parents, or they can be guarded and defended in the first days of their life, and a similar variety of parental behavior is found in the treatment of the developing fry. 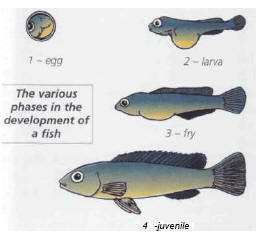 The incubation of the eggs, which lasts several days, sees the development of the embryo. When this is completely formed, it moves about until it breaks the egg's membrane: this is the hatching. A larva emerges, differing from an adult in its form, size, and the proportion of certain organs. The larva has highly developed eyes, for instance, allowing it to spot its prey. It also has a vitellin vesicle, which provides it with food reserves during the first days following its emergence from the egg (except in livebearers of the Poeciliid family). The larva gradually evolves, over the course of a few days or weeks, depending on the species, and modifies its behavior to become more and more like an adult. It turns into fry. Some fish lay their eggs on a horizontal support, then ventilate and protect them from the rapaciousness of other species. The vitellin sac, or vitellin vesicle, constitutes the fish larva's food reserves in the first days of its life. It derives from the vitellin of the egg - the equivalent of the yolk in poultry - accumulated by the female over the course of the maturing process. It is sent along the blood vessels, which distribute these reserves around the body of the larva. This allows it to survive until it is able to catch prey itself, i.e. a few days after emerging from the egg. The vitellin sack of these 15-day-old larvae has been practically all used up. This is normally modest in size, as it is used to isolate a pair of reproducing fish and their future offspring. There is no need for a bed, except for some species (the Cichlasomas, for example). A rearing tank must be heated but only moderately filtered. Avoid any systems which may "swallow" the eggs and the fry. Aeration is not obligatory. Fill the tank with water taken from the parents' aquarium, which can then be gradually modified to obtain the precise characteristics required by the reproducing fish (pH and hardness). A support should be provided for the egg-laying, and this can be either natural (plants, rocks) or artificial (PVC). More detailed information on this subject, family by family, can be found below. 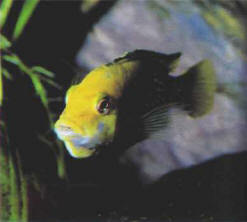 This female Cichlid, which incubates her eggs in her mouth, finds greater peace in a rearing tank.